I have admitted that I have not been cooking a ton this summer, but there are two things that I have made over and over. Blueberry Crisp and these pickled shrimp. 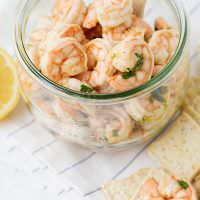 I have made these pickled shrimp every time we have had people over since I discovered this recipe. I have been on a really big shrimp cocktail kick, and saw this recipe when I was flipping through Southern Living. I had everything in the house, so I made it that night for dinner. The shrimp are cooked until just done, then pickled in a quick vinegar mixture that is loaded with garlic, herbs, and lemons. They are refreshing and light. Perfect summer food. I made a big salad and threw these on top. So, so, good. I made these as an appetizer when we had friends over for dinner and I served them with Saltines. The salty cracker is perfect with these shrimp. I love this recipe. I always have shrimp in my freezer, and this has made many, many, appearances on my table this summer. I usually buy really large shrimp, but I like the smaller ones for this recipe. Add olive oil, vinegar, dill, parsley, Creole seasoning, and garlic in a small bowl. Add lemon and onion to a large Ziploc bag. Add oil mixture. Add shrimp to the bag. Toss to combine. Chill for 2 to 6 hours. Remove from marinade. Add salt and pepper to taste. Add olive oil, vinegar, dill, parsley, Creole seasoning, and garlic in a small bowl. Add lemon and onion to a large Ziploc bag. Add oil mixture. Add shrimp to the bag. Toss to combine. Chill for 2 to 6 hours. I have never tried pickling shrimp but these look so darn tasty I have to try them!! Yum! Do you buy pre-cooked shrimp or cook them yourself? I always cook them myself, but you could use precooked shrimp. These are delicious. Cold and refreshing. Pickled shrimp? 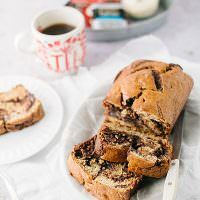 I have never heard about this one, but your recipe sounds awesome! Plus, I am also on a shrimp kick this summer. These will be perfect for the weekend! me too! I can’t get enough cold shrimp. Pickled and cocktail all the time! Pickled shrimp?! How have I never done this before?! I don’t know! I make them all the time. Perfect for hot summer days! Hi! These look amazing. I was wondering if you have tried these with an Asian style seasoning? I’m looking at making Asian salads for lunch, and I imagine these shrimp with ginger, soy, scallions, basil, and sriracha. Thoughts? I think that it would be great. Experiment and see how it goes.